What is it about the minute? What strange and compelling draw does the minute have on us all? Why is the minute so important to so many? The word "minute" comes from the Latin pars minuta prima, meaning "first small part"; we talk about being "just a minute" when called for dinner; we say it won't take a minute when we are doing something we don't think will take very long; we have seen the films: One born every minute; Gone in sixty seconds. The Minute. So significant to so many. On the night of the 27th of March 2019, just two days before the UK was originally meant to leave the EU, the minute suddenly became a very important figure. 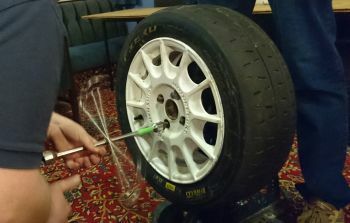 It was the night of the second Pit Stop Challenge of the year, and expectation was just as high at Kibblesworth Club as it was at Westminster. It is probably fair to say that the better evening was had at Kibblesworth, where there was at least a definite result. Phil was first to go, and to the amazement of everybody set one of the fastest times ever seen for the event; everything went right for him on the night, the nuts spun off amazingly quickly, the wheel was off in a trice, back on at the first attempt followed by all the nuts without any trouble whatsoever and then spinning the wheel brace like a dervish to give him an incredible 1m 6.39 seconds to really stake his claim for the win. Incredible. Gary followed, obviously keyed up by his co-driver's result and presumably thinking that not only had all the stars aligned but the high pressure currently sitting over the UK must be causing fantastic things to happen to metal. In truth, he could very much have been right, as his time of 1m 11.93s was his quickest time ever. Lee was hanging around, biding his time, watching and waiting. He said he was waiting for Brian to take his turn, and so the younger Townsend went next. It was not to be his night, as nuts didn't spin, the wheel was not as accommodating as it had been for Phil and Gary, and it all just seemed to take those precious few seconds more, all reflected in his time: 81.66s. Tosh was quick to follow, not expecting great things, and in this didn't disappoint; although he looked to be fairly quick to start, he just couldn't get the wheel aligned up when putting it back on, losing valuable time and eventually ending up with a quite disappointing time. Lee was next, settling himself down with a very measured expression, concentrating on his target, thinking hard about how to take victory in this event. Always competitive, never holding back, Lee was out to win. He positioned the wheel brace very carefully, steadied the wheel, took a deep, slow breath and held it in for what seemed like that minute. He looked at Gary, slowly exhaled and asked: "Ready?" On Gary's affirmative answer he was off! It was, to be honest, a joy to watch; his hands smacking the brace and twirling it in a blur, dropping the nuts on the floor and on to the next one without hesitation, the wheel off, touching the floor and then back onto the studs almost immediately causing Tosh to wince in anguish at his own unfortunate attempts. 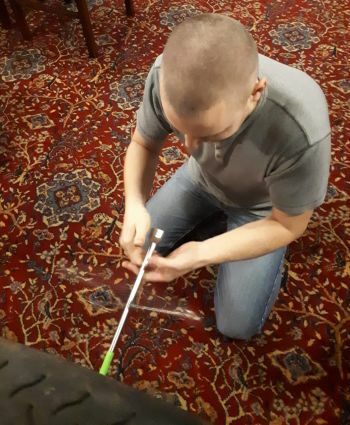 Before anyone could almost take a breath, the wheel brace was banged onto the floor with a shout of "Done" and all eyes went to Gary for the time. It looked quick, it felt quick, everyone knew it was quick. The only slightly uneasy face was Phil's, having set such a quick time himself he was now the one who was holding his breath. And it was quick, too: even quicker than Phil, by just over a full second. Lee was elated, although of course he was now in the same position as Phil had been; top of the times for now, but with many more to take their turn. As it happened, no others could match his time, some doing well to start, but finishing badly; others whipping the wheel off in record time but struggling to get the nuts to spin when replacing the wheel; the rest just not hitting the target time, it was, just too quick on the night. A brilliant result for Lee, pipping Phil to the win and gaining maximum points in the Superstars Championship; a great second place for Phil, beating his average Pit Stop time by almost 15 seconds with a superb display of dextrous brace work; a great third place for Gary, also hitting the sweet spot tonight and amassing a healthy points haul. Many thanks to Gary and Phil for putting the event on and bringing the rig and all associated hardware. Points in the Club Superstars Championship to all who took part, Lee moves up to third in the Superstars Championship, Ewan drops down as Phil takes his place and Gary moves up the ladder. Next week: Karl's long awaited Quiz: whilst we have all been waiting almost as long as Brexit, hopefully the questions won't be three years out of date. For many Americans of course the initials QVC stand for Quality, Value and Convenience. For those members of Whickham and District Motor Club that attended on the night of the Spring Equinox 2019 they may instead have stood for Quantity, Volume and Capacity, which of course was far more appropriate as it was the night of Tosh's Filling Station challenge. So what exactly is the Filling Station Challenge? Just look at the acronym above - it is a test of a member's perception, of their evaluation, of their imagination and of their sense of understanding of Quantity, of Volume, of Capacity. The concept is very simple: take a container of unknown capacity containing a liquid, pour what you think is a specific quantity of water into a different container of unknown capacity, then weigh that volume of water and see just how close you are to what you thought you were dispensing. The results are often surprising, sometimes amazing, usually unexpected. 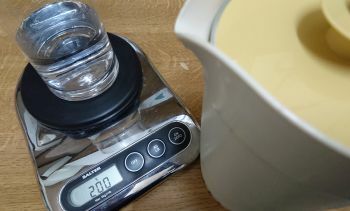 This meant we could simplify the measuring process to weighing the amount of water in the container, and convert it directly from milligrams into Cubic Centilitres (cc). The challenge was to guess three distinct volumes of water: 500cc, 300cc and 200cc. Each try was weighed and the results noted, with each cc over or under the target amount attracting a point. The winner would be the member with the least number of points. It is one of the most interesting things to watch people working out in their own time, just how much they thought a certain defined volume of water was. For some, they slightly under of overestimated, for others, their attempts were wildly off the mark. For two of our competitors, their mental calculations proved to be absolutely spot on with perfect scores, whilst some were just nowhere near. Nevertheless, just about everyone at the Club took part, they all enjoyed it immensely and the anticipation at the revealing of the results was palpable. A brilliant result for both Ewan and Tosh, showing that they certainly have an eye for a quantity of liquid. Could it be that Tosh is so familiar with the standard British Pint that he knows just how much is left before going to the bar for a refill, whereas Ewan has an infinite appreciation for just how much fuel is required to reach the end of an event before running out that he can see it without trouble? Who on earth would know? A great third place for Brian, reinforcing the fact that no matter what challenge is thrown at him, he always manages to be very close to, if not at, the top of the results. A superb fourth place for Matthew, showing a rare and surprising side of his knowledge, and a brilliant fifth place for Alastair, showing that a good result is always possible no matter wherever you might personally think you may end up in the final placings. Many thanks to Tosh for putting the event on and bringing a myriad of accoutrements along to facilitate the event, for not only setting up all the paraphernalia on the night but also creating a great atmosphere by successfully inviting almost everyone to take part on the night. Points in the Club Superstars Championship to all who took part, positions changing once again (as is quite normal during the early stages of any Championship battle), Ewan catches up with Dad Lee in another father/son battle and a thoroughly enjoyable evening was had by all. It is a well-accepted fact that 'Practice Makes Perfect', and that is why for many years young men undertook their rite of passage as apprentices as they looked ahead to the day they became qualified and started their working lives proper, whether that be in the shipyards, as builders, joiners, brewers or whatever. Doing something over and over will always help you to initially improve and eventually perfect your technique, and subsequently go on to become, hopefully, a master of your trade or profession. For those of us who like to compete in Motorsport, that practice is essential, whether it be the sighting laps of race circuits, the familiarisation of pacenotes and tulips, the careful learning of just how a vehicle responds to differences in road surface, tyre pressures or weather conditions. The results are then clear to see in qualifying sessions at race circuits, or when a rally crew are so familiar with each other they instinctively know what the other is about to do or say. However, all of this takes time and money, and the opportunity to actually try out and hone these skills in an appropriate place; certainly not the public road, but private roads and tracks cost money. Hence the rise of the simulator. Often dismissed as nothing more than a 'video game' by those who either don't understand or otherwise don't fully appreciate the subtleties built into today's programmes, they are a very valuable tool in the arsenal of those wishing to improve their skills, especially as the dynamics of today's crop of race and rally games has progressed so far that they have the most amazing ability to really simulate exactly what a particular vehicle would do, on that day, under those conditions, in that configuration. To our incredible good fortune, we can now enjoy the most amazing and wonderful experiences for less than the cost of a reasonable night out. Having brought their race simulator setup of seat, steering wheel, pedals and large screen TV to the Club last year for what was a very enjoyable and successful evening's entertainment, Ewan and Lee Tindall once again ferried the entire assembly to the club on Wednesday the 6th March for a very much anticipated night of Formula 1 simulation. The setup was quite impressive; the seat was extremely comfortable, the adjustment plenty for all who took part, the controls reasonably easy to understand. Ewan also made the game very fair by offering each competitor a full five laps of the Interlagos circuit in Brazil, in order to let each and every member familiarise themselves completely with the rig in their efforts to get fastest time of the night. Despite there being a Cheviot meeting taking place upstairs, the take up was still very healthy, with eleven drivers taking part in the challenge. Some were good, some were great, others not so impressive. For many it was probably the first time driving with the 'Halo' which was an unusual experience. For others the manual gearshift would have been another new concept to grapple with, whilst some were not bothered at all. The middle order looked to be the most competitive, with third to sixth covered by a shade over half a second, whilst those at the lower end were not quite as close. Most entertaining drive of the evening was provided by Matthew 'Mashfoot' Price, who proceeded to slam into more walls than a full season at the Brickyard, much to the amusement of those watching. Sublime drive of the night went to Ewan, who showed that it was possible to drive around the circuit carrying much more speed through the corners than anyone else, in the most delightfully smooth manner possible. A superb and not unexpected win for Ewan, showing that he certainly had the skill and dexterity to sweep all before him tonight; a brilliant second place for Dad Lee, his result bringing him a special bonus of a leap up the Championship standings; a great third place for Jamie, his usual quiet self, just getting on with it and achieving a good result to boot. Many thanks to Ewan and Lee for bringing in the rig and organising the event on the night. Points in the Superstars Championship to all who took part, this week's results seeing a real change in the standings and perhaps the signs of Lee's ambitions for the year; always competitive, he looks to be building his challenge for 2019 early. Brian and Tosh maintain their positions but the older Townsend now looks more vulnerable to attack: and with Ewan's result bringing him leaping up the leaderboard, is this a sign of the coming of the Tindalls? Are the wolves starting to circle already? It is often said that the simplest games are the most entertaining and enjoyable, and that may well have been the case on Wednesday the 20th February when WDMC members took part in the first Steering Wheel challenge of the season. In simple terms the challenge is little different from the little games we played as children where we had to get a series of small steel balls into various holes. 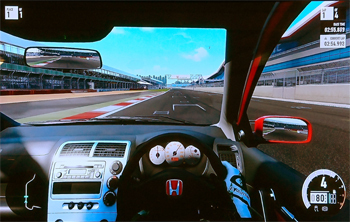 Our own Steering Wheel Challenge takes it a small step further by adding a motoring twist of making the game the shape of a motoring circuit and fitting it to a steering wheel, all against the clock. To be fair the event always attracts a good entry, mainly because it is quick and simple and relies on the individual skill of the competitor, together with a healthy dose of luck (if you are lucky enough to get a good few of the balls in the holes at first go). Technique is everything in this game, and those who don't understand the different principles of least action approach vs the direct Newtonian equations of motion may well struggle to comprehend just why some people can manage to get all the balls in all the holes in such quick times, whilst others take more than a few minutes to do the exact same thing. First to try his hand was Peter, starting well and getting the first few balls in place well, but then struggling to get the final few into place. His time was steady but not fantastic. He commented that it was almost as if there were magnets under the test to stop the balls going into the holes. Gordon followed him immediately, again setting off in hot pursuit but slowing down as he found the last few unwilling to drop. In an almost identical huff of frustration, he commented that it almost felt like there were magnets under the game. Gary was next and was an absolute joy to watch as he rapidly got almost all the balls into their holes in around 30 seconds, grasping the second wheel with confidence and slotting them all home to record a fantastic time of only 51.48 seconds - that would take some beating! He was followed by Lee, confidently grasping the wheel and getting everything home in a very respectable time of only 1m 35s to place him temporarily second. Lee was followed by Matthew, Karl and Alastair, all doing their best but ultimately realising that Gary was pretty much assured of his place. The Brian took the stand, known for his very rapid placement and unerring accuracy, he was off like a shot, determined to not only beat Gary but set a time sufficiently quick to stop Tosh from nipping in and snatching the place from him. He was quick, very quick, and recorded a blistering time of just 38.01 seconds to move into the lead. Tosh came next, always very competitive, always very quick and accurate, one eye on the challenge and another on Brian's time. He was off immediately, almost all the balls in the first game straight into their slots, a few seconds hesitation on the last couple, then onto the second wheel in a trice, slotting each of them home in the shortest of time, getting the most difficult ball in first and then just finishing off the rest. Until, that is, the first one popped out, causing a few valuable seconds to elapse before it dropped back into place. That time was crucial, as it netted him a total time of 44.83 seconds, some six seconds slower than Brian. Guy and Phil were last to go, and Phil went first. It looked almost as if he had the hands of God as he amazingly dropped almost all the balls into place in the quickest time seen in many months, quickly grabbing the second wheel and incredibly almost all the balls simply dropped into place, leaving just three to go. Phil finished off those three in the twinkling of an eye to record a fantastic time of a mere 34.31 seconds, almost guaranteeing him victory. Only Guy was now left to see if he could take the premier position. He started well, but the run was simply not with him tonight; although he got a good number of balls in place early on, there were a couple of rogue balls that simply would not go where he wanted them to, each one hovering at the very edge of the holes but just not dropping in, causing Guy much frustration as he desperately tried time and again to drop them into place. He did eventually, but at a cost. He was not to be victorious tonight. A superb and unexpected win for Phil, taking the victory and thoroughly enjoying it to boot. A great second place for Brian, almost taking the win had it not been for Phil's amazing start, but beating father Tosh in the process to further emphasise the skills of the young can beat the experience of the more senior members. A fine third place for Tosh, not that many seconds separating him from the win but certainly enough to make him up his game next time. Many thanks to Tosh and Brian for bringing in the Steering wheels and tracks, and organising the event on the night. Points in the Superstars Championship to all who took part, this week's results seeing Brian and Tosh increasing their lead at the top although Phil's 12 points move him up to third, followed by Lee and Gary as Jamie slips down to sixth. 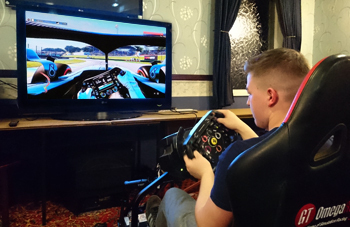 Next event: Lee and Ewan's simulator night; get yourselves ready for a video game extravaganza - hopefully it will be Formula 1, but then you never know what will appear on the night. Two words that go together so beautifully well. For many years the car was referred to as a 'Motor Car', eventually being shortened to just 'Car' or even 'Motor'. Some of our older members might even remember the truly appalling song by Alexei Sayle from 1982 called 'Ullo John! Gotta new motor?' - there was a reason it took two years to become anything like a hit, although the spin-off TV advert 'Ello Tosh! Gotta Toshiba?' from Toshiba featuring Ian Drury was far more successful. There are still people today who refer to their vehicles as simply 'motors'. Whilst there are of course a huge number of clubs of many different types around the world, there are few that arouse as much passion as the 'Motor Club', and at Whickham and District Motor Club we like to keep the passion alive and kicking as much as possible by holding weekly competitive events where club members pit their skills against each other in the pursuit of both excellence in competition and points in our regular Club Championships. This week it was a stalwart of a modern man's upbringing: Scalextric! 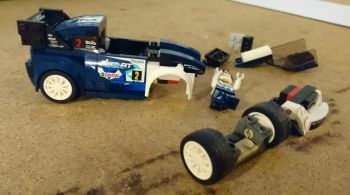 There are few toys that arouse the passion and competitive spirit as much as these tiny electric cars, racing around a pre-determined circuit at breakneck speed, pitted one against the other in a bid to beat your opponent and taste the sweet nectar of victory. It is of course one of the simplest of games, only requiring a little floor space and a number of willing volunteers to replace the often erring and wayward cars as they spin or fall off the edge of the track. The competition was very straightforward: each competitor was to race against one another over two heats of ten laps, their times added together to give a total cumulative time. The top eight would go forward to the quarter-finals, the winners of which would then race each other and so on to the semi-finals and ultimately, a 20-lap no holds barred race for the glory of Scalextric champion! (Well, for February at least). The heats were bravely fought, some were very accurate but slow; some were very quick but went off a lot; some were at times quick and other times slow, others were just not good at all, whilst there were those that shined like a beacon above the rest. The volunteers did a sterling job, replacing the tiny cars as they hurtled off the track, deftly slotting the vehicles back onto the track as quickly as they could, hopefully not delaying the racers or causing them too much loss of track position. The trick to being a successful driver was to be as smooth as silk. Peter Metcalfe had been as fair as possible by bringing two cars that were very evenly matched, however the track itself was actually the cause of most of the problems on the night. 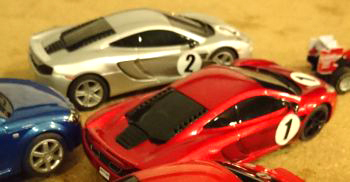 There were two cars, one red, the other silver, and each driver raced each car to keep it fair and even. Unfortunately, there were parts of the track that suited one or the other, and it was a real feat of skill to keep control of each of the cars and prevent them from becoming as wayward as they obviously wanted to be. Some competitors fell very much victim to these lost seconds as their cars were replaced on track; their guides sometimes refusing to sit in the slot first time, causing the slightest of delays that seemed to be exaggerated as their opponent flashed by, gaining valuable metres in the process! As the event progressed the atmosphere became, just like the cars, more electric; as each racer fell by the wayside, those remaining became more alert, their concentration more intense, their focus more direct. The quarter finals went to the semis, with Guy facing Peter in one heat and an all Townsend battle of Brian vs Tosh in the other. Peter's smooth driving was to be rewarded by a win as Guy went off early, losing just enough time to make catching up an all but impossible task. Then, almost as if Groundhog Day had just started all over again, Tosh suffered the very same fate, by the very same method, as an early off caused him to lose too much time, and in his frantic efforts to catch up with his son, he was just too wayward, too lairy, too wild and didn't have the pace to make up the difference. Brian was far too smooth and simply uncatchable. The final was therefore to be Brian vs Peter. This time it was a 20-lap marathon, winner taking the glory. A spin of a coin decided who could choose their car, and it was Peter that had the pick: his choice was to prove his best decision of the night. By picking the silver car, he had that slightest of advantages of the inside track on the most slippery part of the circuit, allowing him that most important element of control as the tiny motor would undoubtedly run wide: a luxury that Brian was to find sadly missing. As they set off, there was nothing to choose between them, then Brian ran a tiny bit wide, his red car sliding almost gracefully off the edge of the track, the resultant few seconds causing him to fall an immediate half lap behind. His next lap saw a similar lapse of traction, causing him to fall a further half lap behind: he was now a full lap down and Peter was driving as smoothly as a man possibly could. For Brian to win now he would have to charge like a man possessed, throw caution to the winds, and hope the wee car would have enough traction to stay on track as he battled back from the brink of defeat - still, he had almost a score of laps to do it. But Peter is a wily competitor, he certainly knows the score, and knows that a smooth and unhurried pace, staying on track and not doing anything silly would net him another Scalextric victory. And so it was to be. Peter's quick but steady progress brought him the victory he desired, and Brian had to settle for a very well deserved second place. A Great win for Peter, showing that a smooth and steady pace will almost always beat those who charge off without being mindful of the idiosyncrasies of the slot car challenge. A very good second place for Brian, his beautifully elegant driving on the night only failing him in the final with the very slightest of errors, unfortunately that one being the architect of his downfall. A great third place for Tosh, also winning the Fastest Time of the Day with a very rapid 84.49s - a pity that his off in the semi-finals cost him the chance to compete in the final. A superb fourth place for Guy, only narrowly losing out by virtue of the slippery outside track that caused him to slip off in the manner of many before him, losing him time that was all but impossible to regain. Many thanks to Peter for bringing in all the equipment and sorting out what could have been a difficult challenge very successfully. Points in the Superstars Championship to all who took part, this week's results seeing a reversal of second place as Tosh retakes the place back from Jamie. Phil and Gary now tie for fifth, whilst there is now a three-way tie for eighth place between Ewan, Guy and Karl. There was of course a time not that long ago when the fourth week of January would have probably only seen at most two events in the Whickham and District Motor Club's competition calendar. Now those times are in the past and we are lucky enough to have taken part in no less than the grand total of five events since the start of December, making this the most competitive start to the season ever. Thankfully we haven't so far had to suffer the prospect of taking part in competitions outside the Motor Club yet, as the weather, although cold up to now, has certainly turned much more icy these past couple of weeks and made the prospect of leaving a perfectly warm and cosy Kibblesworth Club something we haven't had to consider. Competition has been as enthusiastic as ever with no less than eighteen existing members taking part so far together with new signee Cameron Whitley who although technically not a member for the current year, still showed a healthy willingness to join in the fun tonight and take part in Jamie's January Junket and see just how well he could do against the might of WDMC's assembled experts. A certain proportion of that previous sentence may not be 100% accurate by the way. Nevertheless, a total of ten competitors signed up to show the world their amazing skill and dexterity in guiding a car around a race circuit on a cold and crispy January evening. Some of the competitors taking part may not have had the full range of skills that might have been expected on the night, whereas others certainly had the enthusiasm and confidence on display, though it might not have converted to results in the manner they actually expected it to. The course was chosen by Tosh: the Silverstone Grand Prix Circuit. Though he eschewed the full choice of aids he was kind to all others concerned and selected a dry circuit, cosmetic damage only to the car, full driving aids and automatic gearbox. The car was chosen by Gary: a Honda Civic EP3 Type R in that most traditional of colours: R81 Milano Red - there really could not be any other choice and the car looked absolutely amazing. Jamie opened the betting with both a serious and competitive lap: his best at 2m 48.3s would give everyone a very healthy target to aim for and one that would require everybody to take a little bit of a risk and push a little bit harder than they might have otherwise been comfortable with. A good start. Gary came next, easing himself into the race gently with his first 'sighting' lap but then absolutely nailing it on his second with a time only two seconds slower than Jamie to state his case. Brian was next, looking to be struggling with the handling of the car; possibly the penalty of not having the X-Box experience and therefore having to adjust his PlayStation fingers accordingly. His time of 2m 49.8 seconds was quicker than Gary, what he considered OK, but accepted was always beatable. Jonny was next, and as he took the controls it was immediately obvious to all who were watching that he was as familiar with this game as he was with a grinder and cutting torch. The car seemed to simply float between the bends and looked so smooth it was abundantly clear to all watching that this was not only going to be a very quick time but possibly the one that really set the standard to aspire to for the night. And so it proved to be, with a time of 2m 44.3 seconds it certainly looked to be the winner. Nevertheless, there were of course still some very competitive members waiting in the wings to show how well they could challenge young Jonny. New boy Cameron put his best foot forward, improving his times from lap to lap, but never able to match Jonny's time, which now looked increasingly safe. Until, that was, Lee Tindall stepped up. Now Lee may not have looked much like the man to take the fight to the younger Chrisp, but then as we have very definitely learned from our years of competition, nothing at all should ever be taken at face value. Lee, as it happens, was a delight to watch, and though his first lap of well over three minutes might not have set the world on fire, his times subsequently tumbled more rapidly than a parade of clowns on the Moscow State Circus, with Lee eventually finishing with a best lap time of 2m 48.0 seconds to assert his authority as 'The Man', taking Jamie's place by the same period of time that it takes to blink a human eye. Stomp. Phil followed Lee and it must be said that his attempts at beating the clock were very probably some of the most entertaining minutes that the Club members have seen in months and months. This was not the stuff of legends; this was not the drive to end all drives. But then, depending upon your point of view and your perception of what counts as quality, perhaps it actually was. It was certainly a drive to be remembered, a drive to commit to memory, a drive not to be forgotten. But it was not quick. Entertaining, but not rapid. Alastair came next, full of confidence, nee arrogance, his demeanour shouting that this was his event. Standing tall and staring at the screen with controller in hand, he looked as though he had the game at his mercy. As it happens, none of the above was anything like the reality; his times were all around the three minute mark, eventually topping out at 2m 54seconds. He was followed immediately by Karl, standing tall and asking all the right questions about who was fast and who was furious, who was there to beat and how many laps did he have. Three was the answer, and that just seemed to galvanise him into action, his first lap a steady 3m or so but his second and third laps only a whisker apart at 2m 53.3 and 2m 53.4s. This would place him sixth and crucially above his cousin, that family rivalry once again coming to the fore. Last to go was Tosh. Never expecting to do well, he would be happy to keep it on the tarmac and come home with any result within a few seconds of the pack. His first lap was as expected, a steady, sighting lap. Not quick, but setting his view according to his preference (and doing so multiple times), finding roughly the right lines and braking marks, of which there were many variations, before going for a better second lap, which was a full ten seconds quicker, although not particularly clean. Tosh's third lap, however, was looking much better, with cleaner lines and better braking, all within the confines of the circuit and definitely looking to bring him a much better placing than expected. That was, unfortunately, until he went off in a spectacular fashion, losing him not only all the time he had gained but a good bit more besides. Sad to see such a potentially good lap go to pieces, but it did look as though Tosh might just be starting to get the tiniest hang of this Video Gaming lark. A Classic win for Jonny, showing he not only knows this game but has the ability to beat all comers when it comes to the crunch; a dozen points in the Superstars Championship as reward for his efforts; a truly superb second place for Lee, showing that the video game evenings are not only the preserve of the young; a great third place for Jamie, perhaps a surprise considering it was his own game, but then again very satisfying to know that though it was his own game, he did not clean up as others have done in the past. 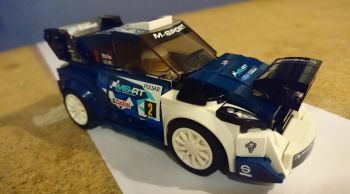 Many thanks to Jamie for putting the event on, bringing his X-Box and game and having something different from the usual Rally Stages. Points in the Superstars Championship to all who took part, this week's results seeing a sudden change in the top positions with Jamie unseating Tosh from second and Lee catapulting himself up to fourth place in a stroke with two brilliant results from two concurrent events. Next event: The February Quiz. Who will be putting the event on this time? Will it be Karl, who hasn't put a quiz on since Pontius was a navigator? Or will it be the postponed Christmas Quiz from 2017? Perhaps it might be yet another of Tosh and Brian's famous 'Cars in Films' quizzes that nobody has a clue what the answers are? Who knows? The only real answer can be found by attending the club on the evening of the 6th February 2019, when all will be revealed. It has had significant impact on millions of people throughout the world over many centuries. Most famous of all were the seven ‘wonders of the world’: the Great Pyramid of Giza, the Hanging Gardens of Babylon, the Temple of Artemis at Ephesus, the Statue of Zeus at Olympia, the Mausoleum at Halicarnassus, the Colossus of Rhodes, and the Lighthouse of Alexandria. The world was said to have been created in seven days. The number seven is also featured in the Book of Revelation (seven churches, seven angels, seven seals, seven trumpets, and seven stars). The Koran speaks of seven heavens and Muslim pilgrims walk around the Kaaba in Mecca seven times. In Hinduism there are seven higher worlds and seven underworlds, and in Hindu weddings the bride and groom walk around the holy fire seven times during the wedding ceremony. In Buddhism the newborn Buddha rises and takes seven steps. Indeed, Seven is also the basis for many myths and folklore; various parts of the world had beliefs about the seventh son of a seventh son; each rainbow has seven colours and there are seven days in the week. There are seven dwarfs in Snow White, and in Japan there are Seven Lucky Gods, who have a ship called Takarabune, the Treasure Ship. For many aficionados, the Lotus 7 was the finest car the company ever made, spawning a myriad of similarly styled cars from a host of manufacturers. It is a well-known fact that if you ask people to name a number from one to ten more will choose number seven than any other number. 7 is, of course, supposed to be nothing other than lucky. On the night of the 16th of January 2019, however, the number 7 may not have been quite so lucky for at least one of our club members. Peter Metcalfe had organised a wonderfully excellent Table Top Rally in the same manner as most of his recent events: a single page of relatively straightforward instructions, taxing for some, enlightening for others, no real dirty dogs and enough different aspects of Table Toppiness to challenge the novices whilst still satisfying the purists. In short, the perfect Table Top for the day. The event started with a nice, clearly identifiable point on the map, followed by a series of cryptic clues before reverting to pairs of numbers. These were swiftly followed by a herringbone, moving on to another section consisting of nothing but numbers. For those who do the Times Crossword, it must have seemed quite easy. For those who chop trees down for a living, it might have been possible at the start but started to appear more difficult as each section was attempted. This would be less clear than at first expected. The final instruction to draw that straight line was from the church in grid square 5465 to Grid Square 5168, yet for Tosh, that infamous seven had already taken over, it had been burned into his mind, it was as if a flaming torch had seared the number into his brain, and he could not see 5168, all he could see was grid square 5768, and in the most delicious irony, there actually was a church in grid square 5768. So Tosh drew his line, extremely carefully, ridiculously accurately, with the finest of lines a pencil could ever draw, between those very two churches. 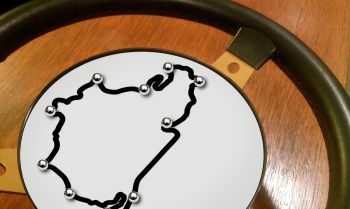 Incredibly, as if to reinforce his dreadful mistake, the line ran absolutely perfectly along a twisty, winding road, criss-crossing the most twisty section of the lane with that most perfect of results: seven crossings. It was just right, everything checked out. His confidence at an all time high, his time quick, certainly fast enough to win this event, and as he rechecked the last section of the route, he could see that all was well, and so he shouted 'time'. Now he only had to wait. A superb win for Guy, stamping his authority on the Maps Championship at a stroke with a very comprehensive win; a brilliant second place for Brian, not very far behind Guy and producing another immaculately clean score with no fails, followed by Gary with yet another clean sheet. Although Gary might have been a little bit slower to complete the event, he did it cleanly, which is the first principle of Table Tops: get the route right and you will always beat those who are quicker but less accurate. For Tosh the results were a real surprise: 3 Fails? That was a crushing result! How on earth could that be? As always, Tosh was far more interested in how he had made the mistakes than he was in his final position. He had simply read a seven instead of a one. His 5768 was actually a 5168. For Tosh, that seven was crushing. However, there were some thoroughly good points for Matthew, showing his absolute dedication and perseverance by not giving up and completing the event with good points in the Championship. Many thanks to Peter for putting the event on, and especially to Guy for stepping in at the last minute to run the event in Peter's absence. Points in the Maps Championship to all who took part, this event just going to show that even if you think you have it in the bag there is always the possibility that things may not be exactly what they seem. Next week: PlayStation. Hopefully not another Rally Game, but then again it could always be tarmac. Flex your fingers, rub your eyes, settle yourself down and get into the digital zone: The first PlayStation round has arrived in the 2019 Championship! Seven? Forget the film, this is serious. There are, of course, some fabulous songs that have been sung down the years about driving. Whether your favourite is 'Thunder Road' by the Boss, 'Road Runner' by Bo Diddley, 'Cars' by Gary Numan or in the case of Gordon Bradford, the truly wonderful 'Crash' by The Primitives, each of us may well have had a song in mind as we all took to the track to try our hands at being the Michael Schumacher of Kibblesworth Workmen's Club on the night of the 9th January 2019. This time, the Kinetic Car Race was just that little bit different: gone was the mechanical advantage of the spring-loaded catapult system employed before, and in its place was nothing more than the Kinesis offered by the application of the driver's hand and eye coordination, together with an understanding of mass, velocity, thrust and a sound appreciation of the effects of friction on a car this time constructed entirely of acrylonitrile butadiene styrene rather than the traditional die-cast metal with which we have become so familiar. The format was as normal as a Gregg's Cheese and Onion Pasty. Nothing was changed for this event and the traditional scoring sheets, laid down equally along the track, each with their simple scoring system clearly visible, sat there, waiting for the little car to come to rest with only the smallest of tyre contacts touching the sheet. That would be, as Mark says in Love Actually, enough. Enough to score the marks on that particular sheet, and certainly enough, if previous Kinetic Car Races are anything to go by, to get you well and truly on the way to a good result on the leader board. Gary was first to go, and it was immediately apparent that this time the scoring would be more difficult. No longer could a competitor calculate the odds by working on an initial pull-back distance and then apply logic and reasoning to work out the optimum next attempt; this time it was all down to a combination of feeling and the careful execution of measured power and direction of thrust of the wee Lego vehicle. It certainly didn't always go according to plan; for Gary he couldn't get the wee Lego car to land on anything at all; for Brian, his best was a single score of 60 points. Matthew fared no better than Gary, missing everything on the track and scoring the equivalent of falling off the top board at the diving Olympics. He handed the small plastic vehicle to Tosh, with the warning that the car would need more than the usual amount of force to get it even off the line. Tosh sent the small car off and was immediately surprised to see the good push he gave it only allowed it to reach the first scoring sheet, however it was a score, and that would certainly mean he wouldn't finish last. His next go was even more forceful, bringing a score of 40 points to put him firmly on the leader board. Each of his subsequent turns would be more and more aggressive; he was determined to see if he could reach the elusive and highly desirable 100 point score: and in his final attempt, he did just that, adding a massive amount to his total and ending up with 150 points. This would take some beating! Phil was next, netting a healthy 40 points, whilst John, Jake and Jamie all failed to score a single point in all fifteen goes. It was starting to look as though this challenge was a far harder one that anyone had imagined. However, Lee was next to try his hand, and was immediately on the pace with a score of 20 on his first attempt. His second scored just as highly, netting him 40 points in just two goes. His next two were unfortunately not so good, and it looked as though he had peaked a little too early, but then, like Tosh, he showed he had saved his best till last, with a solid 40 points coming on his last attempt. Peter hit the ten point mark on his first run but just couldn't repeat his success on any of his subsequent runs, whilst Alastair, Mac and Gordon all failed to score even a single point, although they were the architects of some of the most impressive crashes seen during the evening. This meant the last man to go was Guy. Maybe not so much one of the traditional high scorers, but then this game was never about that: anyone could be a champion, anyone could, in the words of Savage Garden, crash and burn. For Guy, this was to be his opportunity to show the others just how the application of thoughtful evaluation and careful preparation would result in a score that would place him higher than over 50% of the evening's competitors. This was his time. His first three attempts brought forth no score at all, but his mind was evaluating all the elements of the event, and so it was at his fourth run he scored a valuable 20 points to place him in the top 35% - not bad for the last man standing! A crushing win for Tosh, instantly putting him up to his familiar second place in the Superstars Championship, a brilliant second place for Lee, proving he loves to compete despite having been away from the club for so long on business, and a solid third place for 'Max Attack' Brian, increasing his lead in the Championship already and showing he is as determined to go for the Title as ever, even this early in the season. Good points for Phil, Peter and Guy, all very valuable and helping them to rise above those who simply couldn't make their cars hit the mark on this occasion. An incredible eight-way tie for seventh place, having never been seen before, and quite amazingly, in a total of 70 attempts this evening, only eleven actually scoring points, with Tosh and Lee claiming six of those scores between them. Many thanks to Gary and Brian for putting the event on, and for adding a little frisson of excitement to an event which we might have otherwise all expected to be the same as normal. Points in the Superstars Championship to all who took part, a big change in the leader board just as we would expect so early in the Championship with positions changing around once again. It is early days yet. Early January doesn’t bring with it the best of the weather, although to be fair it is generally just very cold and frosty with the crispness that comes with temperatures that hover around the zero mark. Not that the prospect of a cold evening would normally keep the members of Whickham and District Motor Club away from their normal Wednesday evening meeting, especially as tonight was the first meeting of 2019 and a good opportunity to meet up after the Christmas break and wish each other a Happy New Year. The evening was a very relaxed and informal one with everyone generally just talking together, chatting about their respective Christmases and how they had spent them; the feeling this year was that most had enjoyed a very peaceful, relaxed affair with nobody really doing much other than chilling out and kicking back after what has been a pretty mad year for everyone. However, nothing stands still at WDMC, and the Superstars Championship is already a month old, with the first event - the radio controlled Autotest - almost a month ago. This is the first year that the Championships have all started back-to-back, with the new season beginning immediately following the last. The RCA was a great event to start the Championship year, with ten competitors all vying for victory and a surprise result that certainly threw the cat amongst the pigeons as far as positions were concerned, with Jamie taking the top spot and Ewan coming a close second. This week, however, would almost definitely see a change in the leadership, as the event is not only one of the most hotly contested, but would bring some of the old stagers out of the woodwork to show the young whippersnappers just how it is done! The Pit Stop Challenge has always been one of those events where you simply cannot tell who is going to do well and who will do badly, and although skill undoubtedly plays a massive part, there is always the element of Lady Luck that dictates just how fortunate some will be in putting the wheel back on the studs and just how freely the wheel brace will spin for some, whilst sticking for others. Brian would be the first to go: flexing his fingers and cracking his knuckles, he was always going to go for the win. Having found himself in what was for him an uncomfortable third position in the Championship table after the last event, he was determined to put an end to that situation and reclaim his rightful position at the top of the leader board. It was of course perfectly achievable, but then again there was always the spectre of Jimmy Knox, who, although rarely competing in the Wednesday night events, does have his favourites, and the Pit Stop Challenge certainly figures highly in that category. Brian, however, was aiming to put the block on Jimmy's challenge; his ultimate target was the win, and his face showed nothing other than fierce determination to make it so. Watching him attack the rig from the very first millisecond, few would argue that he was going to be anything other than victorious; he absolutely stormed the first part and had all the wheel nuts off in a shade over thirty seconds, the wheel was off and on again in the blink of an eye, Brian lining up the studs with impeccable accuracy, then spinning the nuts back up with amazing speed. His time, although not the quickest we have seen in this competition over the years, was extremely quick: 1m 10.74seconds and a target for every following competitor to aim at. The marker had been well and truly set. It was, of course, an achievable target. Every subsequent competitor could have beaten that time, but as each one came to the rig and tried their pest, they fell those few critical seconds short. Gary less than three seconds behind; Tosh only seven seconds adrift, Karl not quite getting there as well as he had hoped. Gordon struggling with the brace, not quite spinning as well as he had intended. Phil, fresh from his awkward fall at the garage, looking very promising until he made the fateful mistake of rechecking all four nuts and taking those few vital seconds longer to record a time eight seconds slower. Guy was next, both deliberate and purposeful, his application and intentions superb but his time unfortunately suffering because of it. It looked very much like Brian was on the home stretch. And then of course, up came Jimmy. Known as the King of the Wheel Change, he readied himself for the challenge, looking carefully at the rig. First he stooped, then he knelt down, then he stood up. It was almost as if he was trying to get himself into the perfect position. In truth, there was something missing; he didn't look quite as poised as he normally does. Eventually he cracked his knuckles, took up his position, then in a flash he was on it, slotting the wheel brace deftly onto the nuts and smacking the free arm purposefully to break the nut free. The nuts spun almost willingly, flying off the studs, Jimmy dropping them directly onto the carpet and on to the next in a flash, whacking and spinning the nut off once again and on to the next in a trice. The wheel was off and onto the carpet, then almost straight back on but just not as smoothly as he would have wished, that microsecond of delay causing a grunt of displeasure, nee frustration, and then it was home; the nuts were back on and spinning up tight, his fingers whirling like a dervish and almost as quickly as he had started the brace was banged down on the carpet to finish. But what was his time? Was it good? Had he beaten Brian? Had he reclaimed his crown as King of the Wheel Brace? Incredibly, he was only third, slower than both Brian and Gary. This night was obviously not to be Jimmy's. A superb result for many, but in Jimmy's eyes, a failure. That was the end, no more would take up the challenge, and the event was done. A superb win for Brian, cementing his place as the most competitive player in the Superstars Championship; an absolutely brilliant second place for Gary, his fastest ever time on the PitStop Challenge in history, with not a loose nut in sight! A third place for Jimmy, unusually, yet not the last time we will see him attack this event with his usual gusto. Many thanks to Phil and Gary for putting the event on. Collecting the rig and setting everything up is no mean feat, and we certainly appreciate the effort the guys put into hosting this event. Without members such as these, we would have no Wednesday night events. Points in the Superstars Championship to all who took part, a big and immediate change in the leader board which just goes to show how even one event can make a big change and taking part is key to everyone's Championship Challenge! The Whickham and District Motor Club's Championship Year is something that is not only looked forward to with a healthy degree of anticipation but also incredibly well contested, and so tonight's event, being the first round of the 2019 Championship year, was certainly no exception. Tosh and Brian were the hosts and tonight they put on a slightly different variant of the traditional Radio Controlled Autotest by introducing not only a secondary element but also a second vehicle: in times past there has occasionally been a problem when some competitors take so long to complete the test that the poor batteries start to die in the car. This of course is not an ideal situation and so in order to prevent such an event occurring again they introduced the concept of a second car for the 'return journey'. In essence, competitors had to navigate a twisty section of the route in one car before parking it and switching to the second vehicle, then guiding that car to the finish via a series of gates and garages in the shortest possible time. Time could of course be gained here by the quickest of controller changes, however, whilst this should have been extremely easy to understand, it soon became apparent that there were some for whom the concept of 'rapid turnover' would be an alien concept. First up was Phil; not feeling his best and looking extremely tired to boot he was, as always, game for a challenge, and did his best to complete the course as quickly as possible. To be honest, his ability behind the proverbial wheel was very apparent as he completed the course in a very respectable time of 1m 6seconds. This set the target for each subsequent competitor. Gordon was next and although the finesse of a radio controlled car may not have come naturally to him, he certainly made a very good stab at it by completing the course in only 1m 21s. Jamie was up next and to say he was sublime would be an understatement: he looked as though he was at one with both car and controller, his smooth action and fluid control setting him immediately at the forefront, his time a reflection of his ability: a very impressive 50.3 seconds: that would be a time to aim for and one that each following competitor would very probably struggle to beat. Tosh tried his best, but as usual, he just didn't have that innate understanding of forward vs reverse and just which way to turn the wheel for which direction he was travelling, and this of course cost him very valuable time. Nevertheless, he posted a time of 1m 51s which was pretty good for him and would have seen him very happy, had it not been for a very unfortunate incident as he laid down the first controller with the slightest and most inadvertent of brushes to the trigger, causing the car to plunge into the back of the garage and penalise him an immediate point! That was a mistake that though he will not make again, this time it counted and so would drop him down the results. Guy was next, a man who admits he definitely finds the intricacies of the RC controller challenging, a black art understood by only the youngsters and very definitely not something that comes naturally to him. 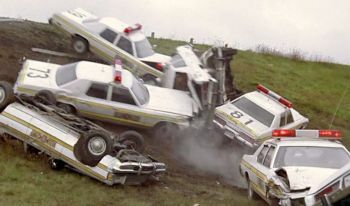 To be honest, that became apparent within the first ten seconds, when Guy's attempt at navigating the first gate resembled the car crash scene from the first Blues Brothers film: the carnage was not only impressive but also comprehensive. At that point Guy did the most sensible thing: gently laying down the controller he uttered that most subtle of phrases: "This is not going to get any better, I retire". There is a certain integrity in a man that can say that and walk away with his pride; most would struggle on and make an absolute pig's ear of it, but Guy knew his limits. His skills lie in other areas that will stand him in good stead later in the Championship, where others may struggle. This is a long year, and points are available each and every week. Peter, however, has no inhibitions; for him he is content to blast his way to either victory or obscurity, either way is fine by him. This week, it was not to be victory, but he did show immense perseverance and his efforts were rewarded with a good showing to finish just behind Tosh. Alastair stepped up to the mark with high hopes; all eyes were on him as he carefully weighed up all the options and took careful stock of the route. As he was counted down the anticipation was high - could he beat Jamie? The short answer was no, as Alastair found the wee cars a little more trouble than he was expecting, catching bollard after bollard and even exiting one garage via the side wall to record more fails than anyone else. True to say this was not his finest event, but then it was the very first of the Championship year, and there is a long way to go. Ewan then stepped up to the mark, a confident smile on his lips and a determination to his face. He set off extremely well and looked to have it in the bag, his first section a blistering 24seconds and plenty of time to complete within Jamie's time; however, a slow changeover and the slightest of hesitations saw him post as final time of 53.24s, putting him in second place. Brian was next, having watched all before him and planned his execution with the precision that only he can bring. He was off like a shot, smoothly transitioning between the first two gates with ease and guiding the RC car into the first garage neatly and precisely. The nest section was clean and quick, his changeover smooth and unhurried but with a determination to succeed. For some reason, the second half had the tiniest of misdirections, causing Brian to reverse the miniature car for just a second or two to get the aim just right; it was to prove to be the straw that broke the camel's back: the cost of doing so adding a fateful few seconds to his time and placing him third overall. It looked like everyone had had their turn and everyone was just about to pack up when Karl walked in; a late entry to be true, but a valid one nonetheless. He considered the route carefully, asked all the right questions, and then set his mind to beating all before him. Perhaps he left it just that bit too long, perhaps he was more tired than he appreciated, perhaps he was just not on form tonight; whatever the reason, he posted a time of 1m 12s to place himself between Gordon and Tosh. Perhaps next time he should try his hand earlier in the evening, maybe that is the key to success. A Great win for Jamie, showing he has not only the skills and reactions of youth on his side but also that he fully understands the intricacies of the RC controller; a great second place for Ewan, putting him second in the Superstars Championship for 2019 and securing his place as a true contender for the crown; a good third place for Brian, maybe not the result that he wanted but certainly good enough to set him up for a concerted challenge for his seventh Superstars Championship. Many thanks to Tosh and Brian for putting the event on, the RC Autotest is always a very well received event and one that certainly brings out the competitive spirit within the club. Tonight was no exception, with ten members competing for places and all getting themselves ready for the 2019 Championship. Points in the Championship to all who took part, this is of course the very first event in the 2019 Superstars Championship and there will be many more points to be had for every event held in the future, so each and every member has an equal chance of winning the 2019 Championship. No more events to be held now until the New Year, when the PitStop Challenge will be held in early January, where we expect to see Jimmy Knox flex his knuckles and powder his hands to take the challenge to the many. Who will challenge him? Watch this space to find out!